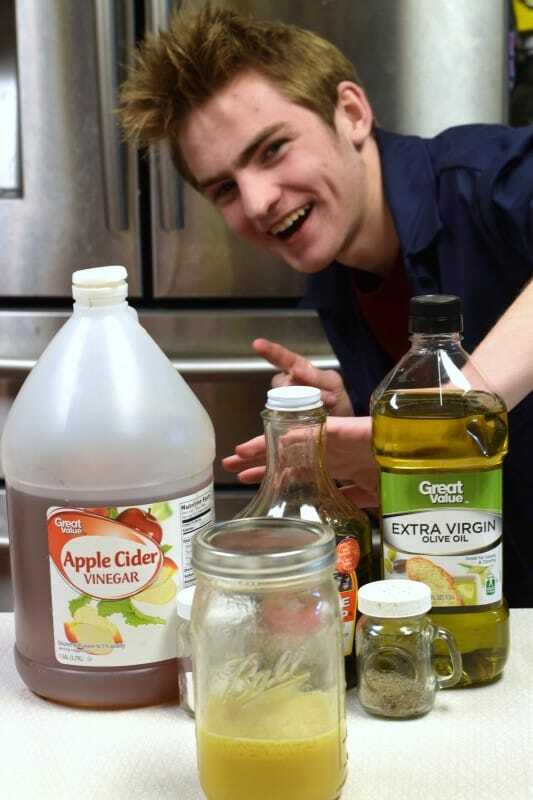 Disclaimer: This post isn’t sponsored by Chick-Fil-A, I’m just a crazy fan of their Super Food Salad so I developed a recipe for myself that is close enough for me not to tell a difference if my eyes were closed. My daughter’s favorite place to eat in the world, aside from our home, is Chick-Fil-A. We usually eat there on the night she has choir practice since that is a night the entire family seems to be scattered to the winds. So when they switch up their menu, I have a chance to check out the new stuff pretty soon after it’s debut. The latest craze is their Super Food Salad and let me tell you what, it was love at first bite. I could live on that stuff! So you know I had to have a go at duplicating the recipe at home. I want to be clear, right out of the gate, that this isn’t Chick-Fil-A’s recipe. I have never seen their recipe and I just developed my recipe from the ground up based on the menu description. However, to my tastebuds, they are twins, maybe not absolutely identical, but twins just the same. 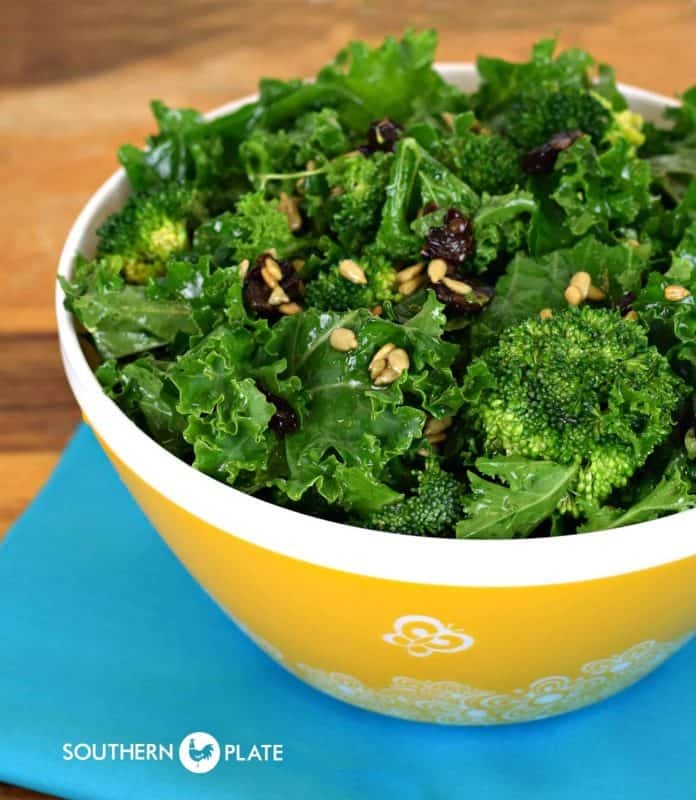 So if you are in love with the superfood salad they serve there like I am, here is how you can make it at home on those days where you may not be heading in the general direction of Chick-Fil-A but you still have a need that deserves to be filled. We also have what we call “Chicken School” from time to time where I pack up our homeschool materials and we find us a booth at the local chick fil a for breakfast. After breakfast, we start on our school work and finish up around lunchtime, which we then have there (of course) before heading back home. The fun thing about Chicken School is how welcoming our local Chick-Fil-A spot is. They refill our drinks while we work, ask if there is anything else we need, and tell us to let them know if we do. The crazy thing is that Katy enjoys it so much that she hasn’t noticed we get twice as much work done on those days! 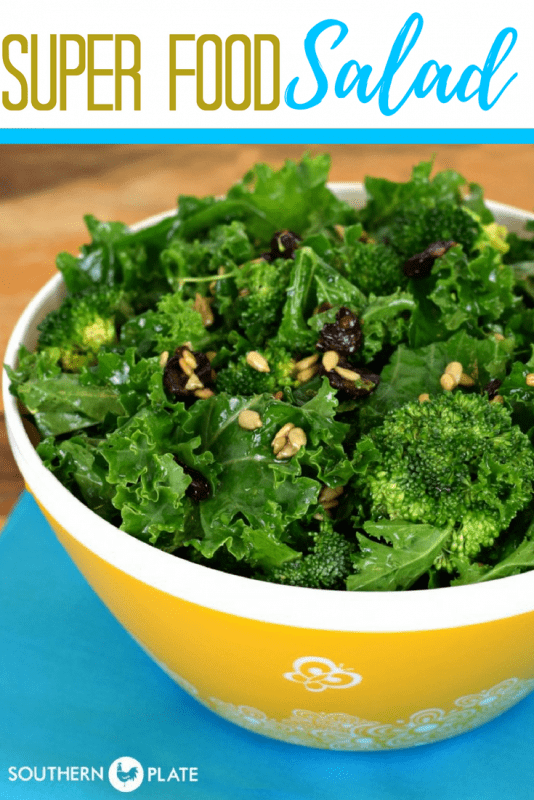 For the salad part, you’ll need Kale, broccoli, sunflower kernels*, and dried cherries. *Chick-Fil-A does NOT use sunflower kernels. They use a roasted nut blend which seems to be almonds, pecans, and walnuts, but you don’t see a lot of those and I wanted more nuts throughout, plus sunflower kernels are cheap :). I was so tempted to add in matchstick carrots, shredded cabbage, etc, but decided to keep it simple and try to stick as close as I could (aside from the nuts) to how Chick-Fil-A does it. I’m glad I did because this salad is stinking awesome. Also worth noting is that Chick-Fil-A uses broccolini. I had to look that up. Sounded like baby broccoli with aspirations or something. Turns out it is some Italian broccoli with smaller florets and larger seeds. Either way, to me it was just another veggie putting on airs so I settled for plain old broccoli, already in a bag, already cut. And you see that big old bag of Kale? It was already cut, too, and cost me less than $3. There was enough to make this salad twice. 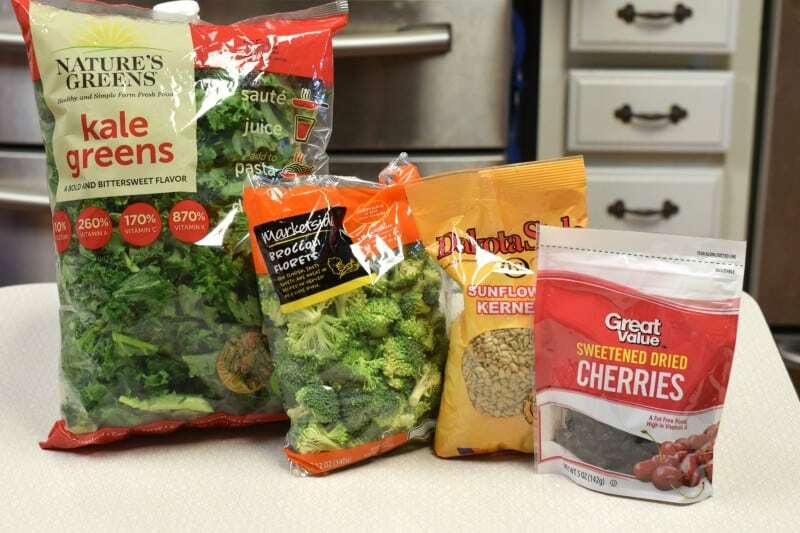 If you decide to make one serving and save the rest of the Kale, just put it in a zipper seal bag with one paper towel and store in your fridge. That paper towel in there will keep it fresh and crispy for twice as long. Works for lettuce and such, too. 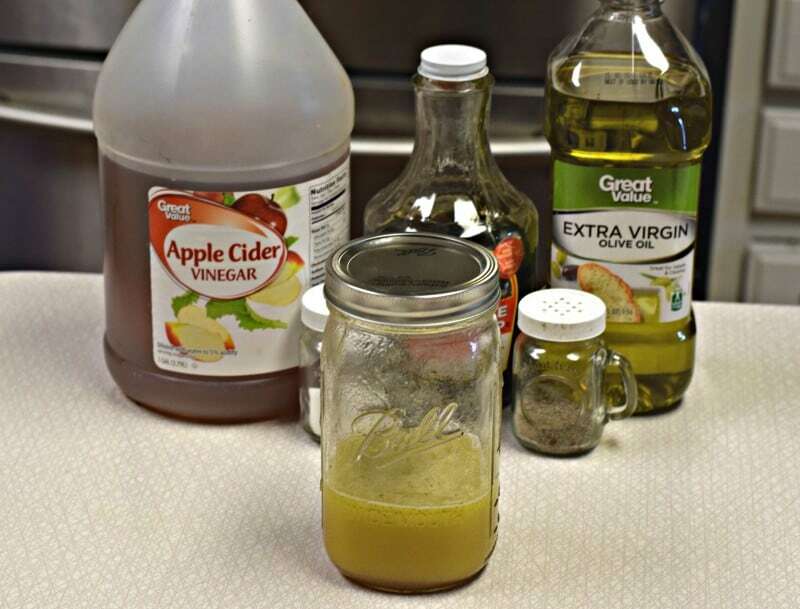 For the dressing you’ll need: apple cider vinegar, maple syrup, olive oil, salt, and pepper. The big old mason jar contains my dressing ingredients. I’m about to put a lid on it and give it a good, hearty shake. If your kids walk in while you are doing this open your eyes real big and growl while shaking it. They will scatter to the winds until you call them back into the kitchen for supper and you’ll have a little “me” time :). Lookie thar. All shook up. Just like Elvis! Oh look, there’s Brady! You don’t see him around on SouthernPlate much these days so when I was taking photos and he leaned in for a bomb it felt like a rare treat for me. I’m hoping you’ll see more of him after this school year as he’s decided to join us at home, customize his studies (more programming and pre engineering classes), and finish up high school with an advanced degree in one year rather than two. It’s amazing what you can do when you don’t have to stay behind a pace car, just another reason why I love homeschooling :). Put all your stuff in a bowl. Pour dressing over. Stir it up real good. Eat it real good. Enjoy! Store this in the refrigerator, covered. Best if enjoyed within the first two days of being made. So how did it turn out? Well, it’s gone and no one helped me eat it :). I love this stuff and can see myself making it weekly, especially since it is so easy. To my tastebuds, I hit the mark with this recipe – but that’s not saying I won’t spin through the drive through to get my fix should the need arise. If you have a Chick-Fil-A near you, I highly recommend this side dish with your next meal! If you want to be like me when you grow up (we’ll discuss your misguided aspirations later), you can order a plain grilled chicken sandwich, superfood salad, and a large Diet Dr Pepper. Be sure and ask for a pack of ketchup and put that on your sandwich because that is how I roll! This recipe is forgivable and easily customized. Add more of whatever you like and less of whatever you don't. 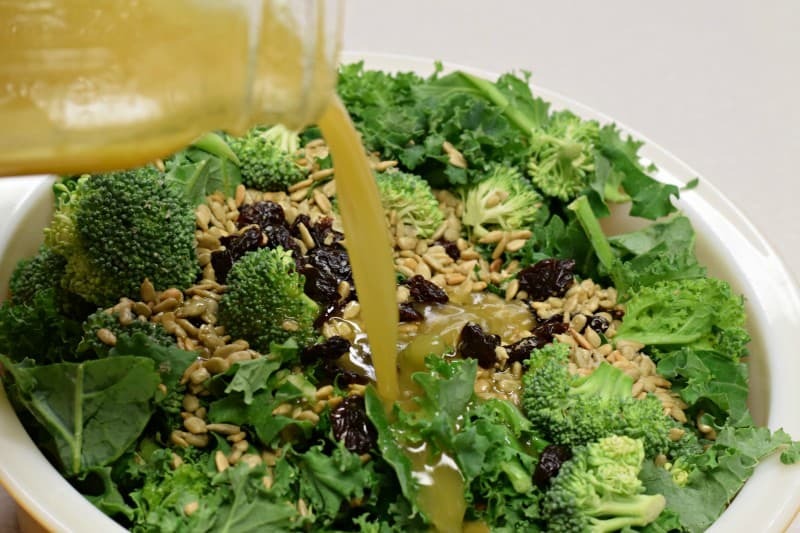 Place kale, broccoli, sunflower kernels, and dried cherries in a very large bowl. Set aside. 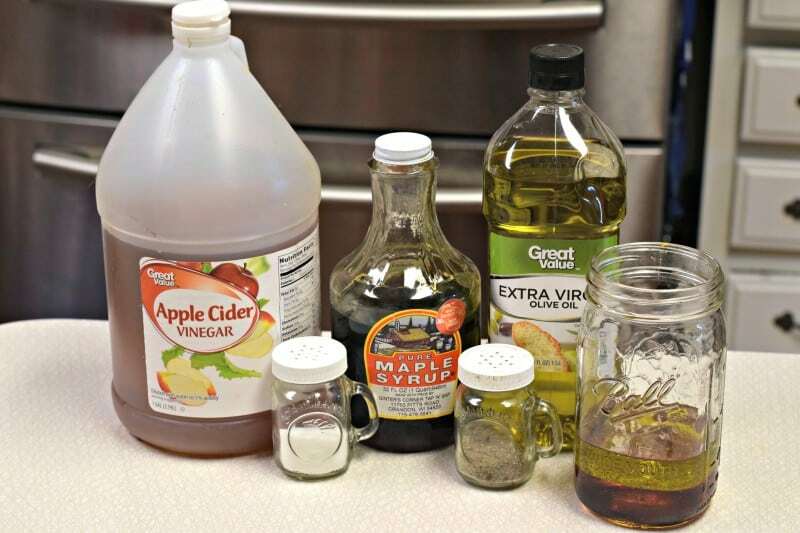 In mason jar, add vinegar, oil, maple syrup, salt, and pepper. Put lid on and shake really well, until combined. Pour over kale mixture and stir to coat. Store, covered, in the refrigerator, for up to two days. Don’t worry about the people who aren’t happy for you. They probably aren’t happy for themselves, either. 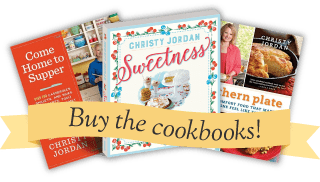 Meal Plan Monday Recipes *Link Up* #2! Thank you Jean!!! I appreciate it! Yummy! Love the Pyrex! The kid photo bombed your pic so he needs to eat the entire bowl of salad! Thank you so much, Kay! Always a joy to see you! haha! Thank you!!! Bonus points!!! Looks good Christy!! And I love narwhals!!! Well better late than never. Wow this salad looks awesome!!! Couldn’t be anything else coming from my most favorite person to get my recipes from. Oh my goodness, I just love you Betty!!! Love the thought of this salad. Will have to try you do wonderful doing all you do in a day. It is nice to still be young and healthy to get so much done. Keep up the great work. Thank you so much Kay, you are too sweet!! You have a sparkling personality and you are adorable and so on and so forth! Seriously, you really are all those..and thank you for this recipe, YUM!!!!!! LOL, thank you Kellie, you are too sweet!!! I hope you get the chance to try it soon, it is my new favorite!! Hey friend! I bet yours is even better! Love ya! Thank you Angela!! Love you too!! I look forward to your posts and recipes. In the picture of dressing ingredients there is olive oil but it is not listed in the recipe. Oh no , What do I do ? Thank you! Here is what you do: Tell me so I can remember that I forgot to list it and then I go back in and add it and the quantity into the recipe and update the post. Done and done! I appreciate it! Didn’t know this was offered. Usually go for this cute fries! Now I absolutely must give it a try at home. Oh my goodness, you have to try it Pat. It is so good!! And good for you!! I’m skeptical of kale in a salad. I’ve had it in a green smoothie and as kale chips but I’ve been too skeerd to try it straight up in a salad. After this post, I think I am almost brave enough to try it. Maybe. I’m skeptical of the narwhal, too. heehee, bonus points! You know, I was the opposite, I was a fan of kale in a salad and I’ve kind of tried chips (I dehydrated mine) but I’ve yet to have it in a smoothie. I’m not sure if I’m up for that. How do you like it? If you’re not a fan the first time, try switching to a different type of kale. Curly kale can be peppery and bitter, which some people are not very fond of, but Tuscan kale is slightly sweeter and more delicate in taste. Ornamental kale can be another option if curly kale isn’t your thing. Love your website! I’m a public high school teacher who applauds your son for knowing what he wants and going after it! Thank you so much Jane!!!! He is so excited!! I haven’t tried the super food salad at Chick-Fil-A yet (I don’t know, can I part with the waffle fries????? Maybe I’ll get both. Plus a sandwich. ) but this looks delicious! Also, I’m sorry that you have to even put a disclaimer because you said something good about homeschooling (*rolls eyes*). I’m loving your recipe, you are so “talented!” Saw the new glasses in the Instagram photos and love them as they bring out your “sparkling personality.” I’m getting a similar style in gray!! Great to see Brady and hear of his plans. Neat idea to have school at Chick-Fil-A and so glad they are ok with it. I had to GOOGLE “Narwhal” and felt like an idiot for not remembering what it was…National Geographic lists it as “The narwhal is the unicorn of the sea….” About this post: yum works, pinterest works, FB works, twitter works. looking good on the upgrade from my end…no glitches here!! Hi Barbara, thank you so much for checking things out for me and reporting back!!! I love that you’ve adapted and shared. I love the C-F-L Super Food Salad, too, but wished that I could have less dressing if I desired. Now I can, because of your talent. You know, I think kale is the Narwhal of the vegetable world: it is unusually wonderful and wonderfully unusual. And sparkly. I think you are right Reta!!! I hadn’t thought about that but I have to agree! Oh my gosh that looks delicious! I see Miss Katie’s a leftie too! It is so good Sue!! Hope you get the chance to try it soon!! Can’t wait to try this. I just saw some honey roasted sunflower seeds at Aldi. I think they’ll be great in this salad! Oh my, those would be a good addition!! Oh my. All that rough ol’ kale and broccoli would just tear up my insides. I’m still an iceberg lettuce person. With creamy dressing. I do love those sunflower seeds though. Sorry! I usually love your recipes but this one does not love me! I love the SuperFood Salad!!! And now thanks to you I can make it at home and eat it all the time!!! Thanks Christy for coming up with the recipe! 🙂 I hope you enjoy it Margaret!! First thanks for the recipe! You’re the BOMB! Now as a previous school employee I can say I detest where schools have gotten to. They deal more with behaviors than teaching. I actually pulled my daughter out of public school at the end of 8th grade. She got a scholarship to a private school which entailed her driving 500 miles a week to get to school and back. Truth of the matter is I had thought about homeschooling her but felt I could not challenge her enough. So I do not regret taking her out of a very rowdy public school and I TOTALLY APPLAUD YOU for the education you are allowing your children to receive by homeschooling them. Thank you Marsha, it is such a hard decision to make, but we are so blessed to have made what we feel is the right decision for us!! Christy, your postings brighten my day. Thank you! Thank you for reading Marty!! Um, do you know how much I love this post? I love it so much….especially the explanation of complimenting a choice doesn’t insinuate a degrading comment towards a different one. While it looks good, I have my doubts … because I really dislike kale. I get a funny taste when I eat it … reminiscent of the taste of cilantro. I think I will try it, but will substitute baby spinach. Sounds like a brilliant plan to me! It is amazing how different our taste buds are. Most people think that everything tastes the same to each of us but that is most definitely not the case! I applaud your adaptation! Our closest Chick Fil A is 40 min. away and we are thrilled to finally have them open here in CT! We go once a month (at least) and are scheduled to go tonight. We love going there and I plan to try the salad. We love kale and I look forward to making your version of the salad. Thank you Christy! I hope you love it as much as I do Tina!! Enjoy your trip and have a blessed day!! A tip for you, buy the nuts in bulk, bag into smaller cups or half cup vaccum bags and store. This keeps them from going rancid, you have nuts and since I don’t live where nut trees grow I love using them. I get mine at Cistvo, but expect any place like Sams or Trader Joes would have them. They are much cheaper at costco than in the grocery store and larger bags, mostly because I suspect even Safeway would hang its head in shame if it tried to charge what it does for those tiny bags in relation to large bags.